While you can easily import photos of your iPhone to your laptop, the same is not the case when it comes to videos. You can watch videos captured from your iPhone on your laptop using iTunes. However, iTunes does not allow you to transfer them to your laptop. You will need to use some other method to transfer videos from iPhone to laptop without using iTunes. Fortunately, there are some available. Third-party softwares such as iMyFone TunesMate are the best way to transfer your videos from iPhone to your laptop without using iTunes. As compared to other media transfer tools, iMyFone TunesMate is a far superior choice for transferring videos because not only does it transfer at high speeds, it also offers tons of additional features that you can benefit from. You won’t need to use iTunes when transferring your videos via iMyFone TunesMate, in fact the transfer process will still work even if you don’t launch iTunes on your laptop. Two-way transfer, meaning you can transfer your videos as well as other media from your iPhone to your laptop and vice versa. You can transfer purchased as well as non-purchased media files between your iPhone and laptop with this tool. No need to launch iTunes in order to transfer your media files. All video formats are supported. Furthermore, you can also preview them before transferring. Faster transfer speeds as compared to other iPhone file transfer softwares. Step 1: Download iMyFone TunesMate from official website for your specific platform (Windows or Mac), then install and launch it. Step 2: Connect your iPhone to your laptop via a compatible USB cable. Step 3: Now select Videos tab on iMyFone TunesMate and then select the video files you wish to transfer. Step 4: After selection, use Export option available on the top of the interface and then click on Export to PC/Mac. 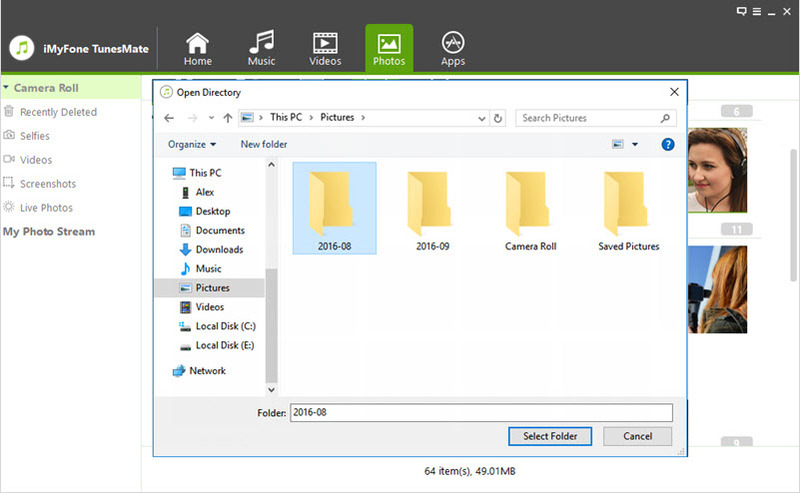 Step 5: You will be asked to select a folder for exported files, choose it and your video transfer process will start. There is another way to transfer your iPhone videos to laptop. 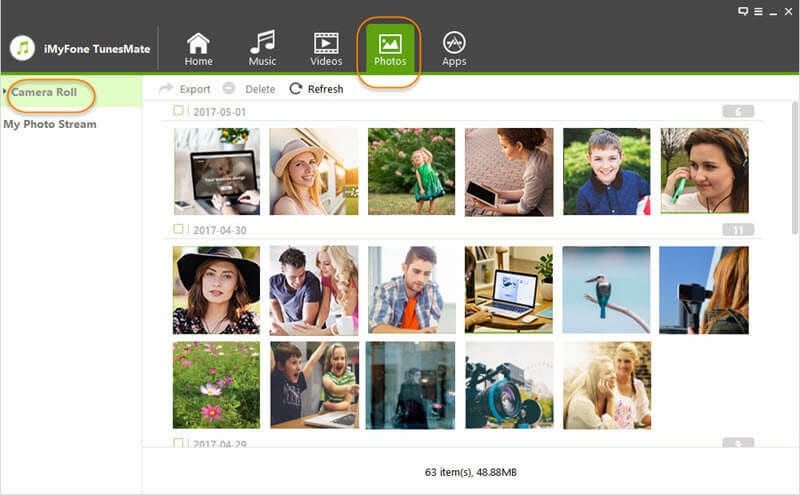 In this method, you will need to use Apple’s iCloud Photo Library for the transfer. iCloud Photo Library automatically uploads photos and videos from your iPhone to your iCloud online storage. Launch the Settings app on your iPhone and navigate to Photos section available in iCloud option and then turn on iCloud Photo Library. 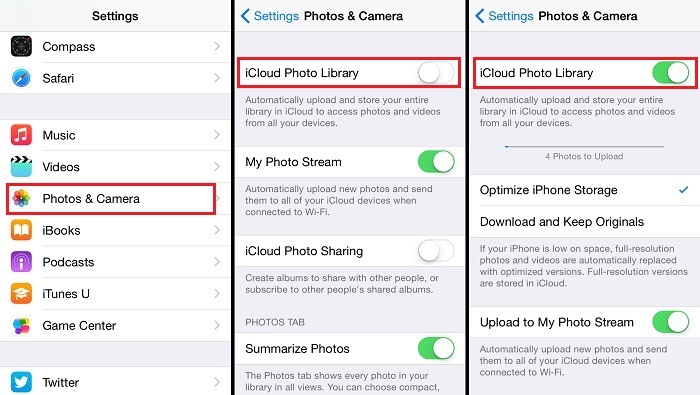 Now your captured photos and videos will be automatically uploaded to your iCloud storage. Visit icloud.com on your laptop’s web browser. Log in using the same Apple ID you use on your iPhone. Now click on Photos option available in the sidebar of the website. You will see a list of your uploaded photos and videos. Alternatively, you can also use Photos and Albums option if you can’t find Photos option in the sidebar. Select the videos you wish to download to your laptop and then click on Download button (cloud icon available at the top). You can either download Unmodified Original format of the videos or there is also an option to download them in the Most Compatible format. Choose any option you wish and your download will start. iCloud offers limited storage space, so if you have multiple videos then you might not be able upload and then download all your videos simultaneously. This transfer method requires constant internet connection. In case of an internet problem, the transfer will fail. You can also use Dropbox to transfer your videos from your iPhone to your laptop. This method doesn’t require iTunes, but will need an internet connection. Step 1: First, install Dropbox app on your iPhone as well as on your laptop. Step 2: Now select the videos on your iPhone that you wish to transfer to your laptop and then upload them to your Dropbox account via Dropbox app. Step 3: Once your videos are uploaded, use Dropbox app on your laptop (log in using the same ID) and navigate to your uploaded videos. Then select and download them on your laptop. Slow transfer speed (depends on your internet) as compared to offline transfer method (iMyFone TunesMate). Dropbox offers limited storage space, so you might have to upload limited number of videos to Dropbox then download them on your laptop, then delete the ones on Dropbox and then upload new videos to Dropbox and so on. Doing this again and again will be a hassle.